To Studio Voltaire in Clapham earlier this week to meet with Laura Harford, responsible for the gallery’s outreach and education programmes and to take a look at its current exhibition, the first in the UK by German artist Amelie von Wulffen. 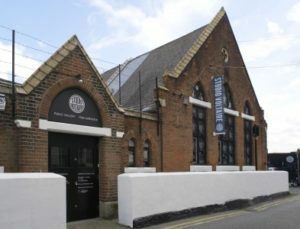 Formerly located in Voltaire Road, hence the name, the gallery and artists’ premises which connect to it can now be found on Nelson’s Row in a bright and light converted Methodist chapel. Laura had expressed an interest in working with Clapham Writers, perhaps on the Clapham Book Festival, but also on other events. Studio Voltaire is currently seeking funding for a project, including a residency this Summer, to work with the local community on various arts including writing and rhetoric, film, walking and place. The inspiration for this is Michel Foucault’s exploration of parrhesia, in his Berkeley lectures in the 1980s, in speaking truth despite risk. All the more relevant now when the President of the United States claims he believes in ‘alternative facts’. She was very interested in the StoryPlaces project run by Southampton University which will be bearing fruit at the Crystal Palace Overground Festival in June and in the whole concept of locative literature. Place and the writer is, regular readers will know, a particular interest of my own ( see Place and the Writer ). If we, at last year’s Festival, identified Clapham’s genius loci as dissent and transgression, Studio Voltaire seeks to explore similar territory, looking at the protesters and non-conformists who have lived and worked in Clapham and spoke truth to power. Laura is drafting a public art strategy for Clapham and Clapham Writers and the Clapham Book Festival will be involved in that. We discussed exciting possibilities like linking discussion and reading with outdoor cinema screenings on literary anniversaries relevant to Clapham e.g. of Graham Greene’s The End of the Affair. I also got to look around at the exhibition, entitled The misjudged Bimpfi. Bimpfi is the protagonist in a German children’s story, an anthropomorphised mushroom, who is unjustly accused of crimes he did not commit and shunned. Von Wulffen (1966 -) is interested in childhood, growing up in the Germany of the 1970s and 80s when the climate was one of blame and constraint in the shadow cast by WWII and the Cold War. Unsurprisingly, guilt and the unconscious feature and her children are often grotesque, transgressive creatures, engaging in cruel acts. 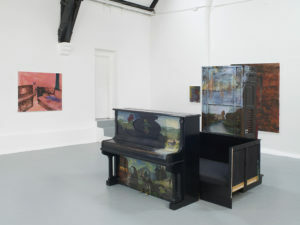 The central installation of piano, bed frame and Catholic confessional, painted with images and with ‘found art’ form an oppressive triumvirate of class, home and church. Elsewhere she references the peasant scenes of Austrian artist, Franz von Defregger, works later co-opted by National Socialism. 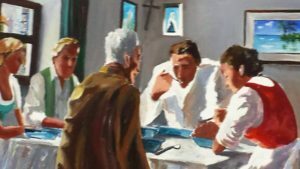 There is often something indefinably unsettling about her paintings, even those images, like the Bavarian scene right, culled from earlier realist painters and juxtaposed with others of a different ilk altogether. 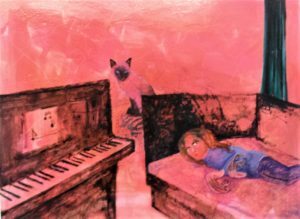 Such as the resting girl child in the box bed, watched by the Siamese in a saccharine pink room with a piano and staring at the viewer while her claw-like fingernails grow and grow. This relates, of course, to the central installation. 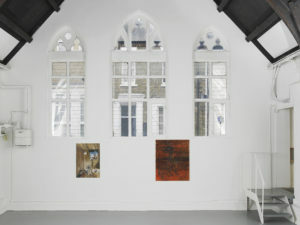 The Amelie von Wulffen exhibition runs at Studio Voltaire until 2nd April and is FREE to enter. Nearest underground station is Clapham Common (Northern line) walk down the High Street and turn right into Nelson’s Row (just past Sainsburys).